I know, just the title and you're like "Reall? Come on..."
But it actually sounds like a great concept. "It is the early 1950s and Japanese Cinema is reaching international acclaim. Nanshu, a poor man with a big heart, is struggling to break into the booming film business, but the only thing keeping him from success is his desire to be the best. After numerous failed attempts, he gets the chance of a lifetime. During an encounter with Japan most ambitious film director, he lands a lead role as one of the eight samurai that will save a village from group of bandits in a new epic film about to go into production. For Nanshu, this is more than just a lead role, it is his ticket out of poverty. But the night before the first day of shooting, the director has a troublesome dream. A dream that will dictated the fate of the film and the fate of Nanshu. And after months of training, there is only one thing Nanshu didn't prepare for: being fired." 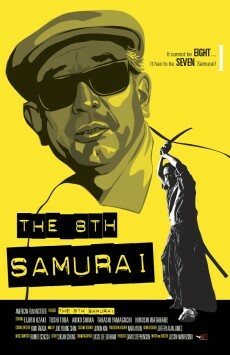 Everybody knows the 8th samurai is Nakadai. Seriously though, this could be interesting if done right. This does look interesting. Thank you for the update. I look forward to when it is released. He's actually in Seven Samurai for about 5 seconds. This is definitely going on my to see list, although it looks like a complete dramatization, rather than some sort of documentary like I first assumed. It wasn't until the first Criterion DVD release that I finally noticed him stroll by the camera when the peasants were looking for samurai. Couldn't really tell that it was him in the old bad quality VHS tapes. On a related note, I can't wait until the new Blu-ray version of Seven Samurai comes out next month! my old betamax tape was as high quality as the criterion collection version. Too bad vhs won out.